I thought that last year we had great beluga encounters until we went back this year! 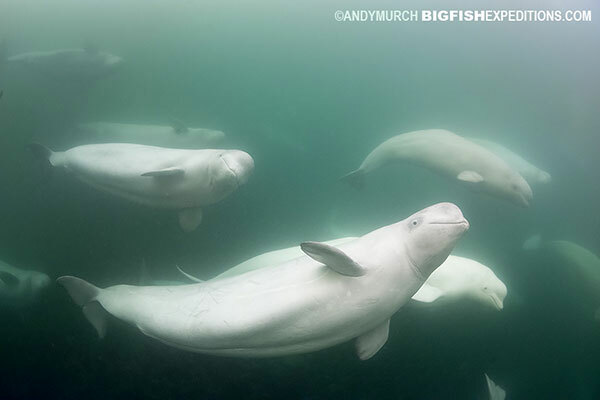 When we first arrived in Churchill the forecast wasn’t that great. Strong winds and rain further south in Manitoba had reduced visibility in the river mouth to just a few inches. 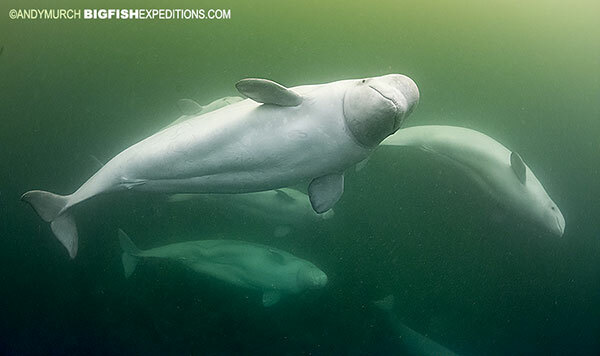 That is the area with the thickest belugas so I expected a challenging week ahead but fortunately with 3500 belugas in this part of Hudson Bay, it was always possible to find pockets of clear water that contained belugas. To give the viz a chance to improve, we spent the first day (instead of the last) aboard the Tundra Buggy. 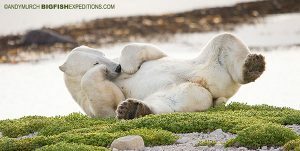 It was a lovely day with mixed sun and cloud, lots of great avian sightings for the birders in the group and two laid back polar bears. One of the bears was very chilled out and let us trundle right up to where he was lounging. The next day the viz had improved a little and we went to sea. 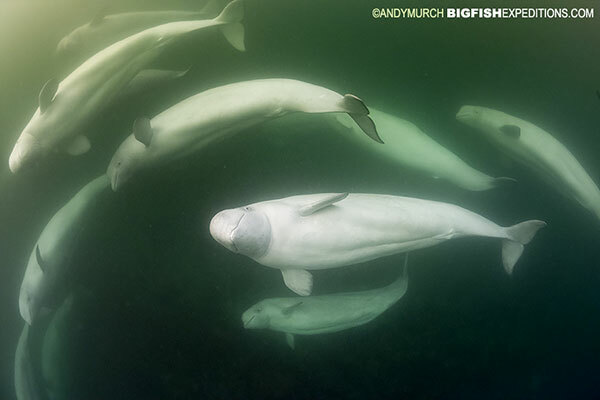 It was great to be back among the friendly belugas, some of which would swim right up to the boat and blow bubbles as if to say get in and play. For the next four days we did just that. The visibility improved everyday. By the end of the trip we were enjoying encounters with large pods of whales that would congregate 2-3m below the surface and wait for us to swim down to them. They were extremely playful. 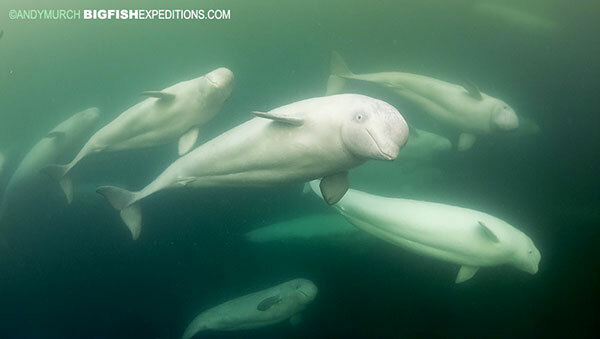 Some were shy but others would swim right up to my camera and look into the lens. When we were in shallow enough water I tried my best to get right to the bottom on my duck dives. 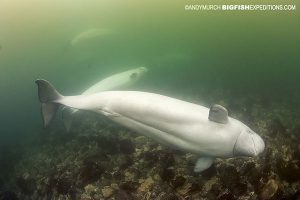 I am am not a great free-diver (especially when wearing a drysuit) but it was worth the effort to watch them hunting for capelin over the seafloor. At one point I picked up a pebble and started tapping it against my camera housing. 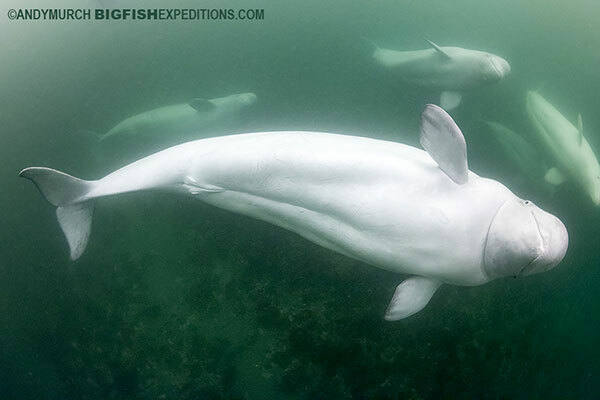 This elicited a loud chorus of squeals and chirps from the surrounding belugas; one more way in which we were able to communicate. While we were at sea each day we would also take a daily run by Eskimo Point; an isolated peninsula on the far side of the river mouth that is a favorite summer haunt of polar bears. 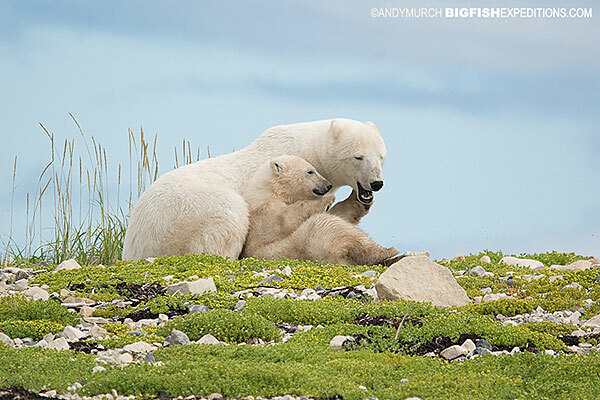 We saw bears there everyday including this momma and cub that we watched relaxing together and sometimes wandering along the point. Between beluga tours, we jumped in our trucks and drove far and wide exploring the shoreline for bears and generally soaking in the tundra landscape. On some nights the clouds parted to reveal the Aurora in all its splendor. 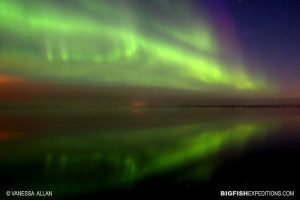 I confess that I slept through the whole event but some of our guests wandered down to the shore to enjoy the light show. All told it was a fabulous week. 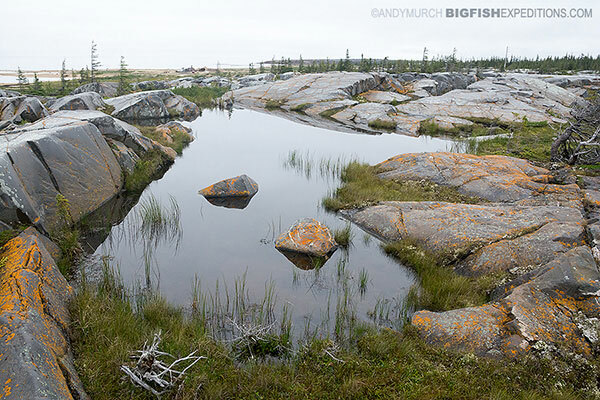 Hudson Bay is a beautiful place with a desolate charm that is hard to convey in just a few paragraphs and pictures.